On behalf of the Board of Trustees, I am pleased to announce the unanimous selection of Clair Ward as the seventh Head of Shore Country Day School, effective July 1, 2017. An experienced teacher, administrator, and leader, Clair is well prepared to succeed Larry Griffin, and lead Shore into its next chapter. Clair has compiled a distinguished career as an educator over the past twenty-three years. Beginning as a classics teacher fresh out of graduate school, Clair rose rapidly in every school in which she has served. 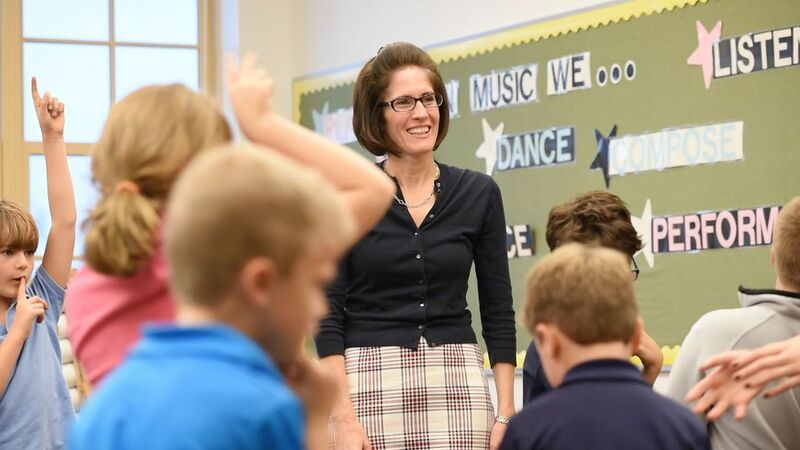 In 2000, she was appointed Associate Head of School at the Phillips Brooks School in Menlo Park, California, where she served for eight years before being appointed Head of School of Valley School of Ligonier in Rector, Pennsylvania, in 2008. During her nine years at Valley, Clair worked tirelessly to forge successful partnerships with students, families, faculty, staff, and trustees. At Valley, Clair followed in the footsteps of a highly successful, long-tenured Head of School, so she knows firsthand the importance of balancing a respect for and appreciation of school history, tradition, and culture with a commitment to personal and professional growth and a keen awareness of the obligation to nurture and support a culture of continuous improvement. Under Clair’s leadership, Valley School has continued to grow and prosper. Working closely with a cohesive and united team of administrators, staff, and trustees, Clair has successfully taken on a wide range of initiatives including curriculum and course development, increased funding for faculty professional development, and the creation of an effective strategy to make Valley better known and understood in the larger community. Importantly, Clair has managed to lead these numerous school initiatives while continuing to teach Latin and public speaking. In addition, she is widely respected beyond campus through her work as Commissioner of Accreditation for the Pennsylvania Association of Independent Schools, which has kept her on the cutting edge of the field's best practices, and acutely aware of the thematic challenges with which independent schools must contend. Clair Ward grew up on the North Shore and attended Danvers public schools. She graduated from Hamilton College, where she double-majored in English and Classics, and completed her M.Ed. in Educational Administration and Curriculum at Boston College. Clair enjoys spending time with her husband, Bryon Williams, a Ph.D. candidate at Duquesne University; their 6th-grade daughter, Ella; and their two golden retrievers, Marley and Hazel. Clair also enjoys singing and playing the violin. 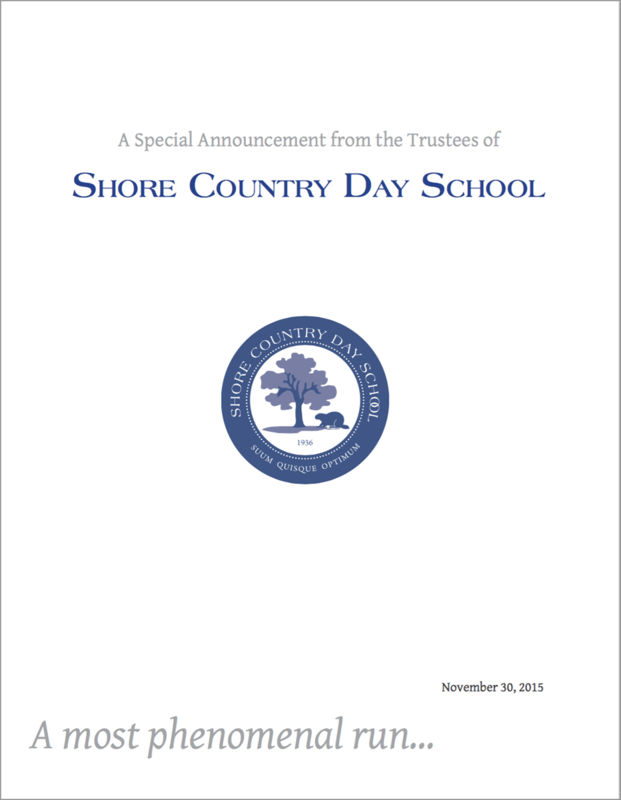 On behalf of the Board of Trustees, I extend my sincere gratitude to all members of the Shore Country Day School community for their commitment to this search process and their invaluable and thoughtful feedback. I am particularly grateful to my fellow Search Committee members for their countless hours of dedicated service. I look forward to welcoming Clair, Bryon, and Ella when they officially arrive on July 1. In the meantime, we plan to invite Clair back with us soon for an introduction to the entire community. Watch for updates regarding this and other upcoming events. My family and I are so excited to be a part of Shore as I anticipate my new role as Head of School. I have enjoyed getting to know some of you and feel honored to join you for the next chapter in the future of the school. For my entire career as a teacher and administrator, my happiest moments are the ones I have spent with children. Watching them grow and thrive, supporting them when things are not going as expected, and celebrating their victories are the snapshots I carry with me no matter where I go. I simply cannot wait to be side by side with the educators and families of Shore. Shore’s deep roots in progressive education and raising children as leaders, thinkers, feelers, and responders in the world are a perfect fit. Your teachers demonstrate a passion for children—something I find so inspirational as an educator. It will be a pleasure to team with such a talented group of administrators and faculty. I have a deep and abiding respect for your beloved Head of School, Larry Griffin. I am grateful for his willingness to partner with me in the coming months in order to plan a smooth leadership transition next summer. His eagerness to do so is a true indication of the mutual trust you have all built together as a community. I am also sensitive to the fact that leadership transitions can bring concern to a community. Community members often worry about what “changes” the new leader will make. I want to take this early opportunity to assure you that my job is not to shape Shore to fit my vision. My job is to help Shore be the best version of itself that we can realize together—through discussion and consensus. In my current school, we have an important saying: “If you think of it twice, it is time for a call.” I urge you all to feel comfortable reaching out to me as we build Shore’s future together beginning next July. I look forward to beginning our relationship over the course of some transition visits in the coming months. In addition to my role as Head of School, my husband and I will be parents at Shore. Our daughter Ella will hopefully join the 7th grade. Bryon and I feel privileged to share the experience of raising a child among the fabulous Shore families we have met or will soon know. We are confident that this warm community will be a wonderful landing spot for our family, which also includes golden retrievers Marley and Hazel. I wish you all the best for the 2016-2017 school year. I look forward to meeting each of you and beginning our work together. SEPTEMBER 6, 2016 - Three finalist candidates selected to visit Shore. The Search Committee met on July 18 to review dossiers of the most promising applicants from the dozens of educators interested in the Shore Head of School position. After a careful review we decided to interview 12 semi-finalists, which is twice the typical number, due to the strength and depth of the candidate pool. On July 31 and August 1, the Committee interviewed the semi-finalists in Boston and then selected three candidates to come to Shore for a two-day campus visit in September. These visits will include two open opportunities for the community to meet each candidate. JULY 24, 2016 - Semi-finalists are selected. Over the past four months the school's search consultants, Marcus Hurlbut and Deirdre Ling from Educators' Collaborative, have been actively recruiting candidates to take over as Shore's next Head of School. As hoped, interest in the position has been very strong. Marcus and Deirdre have been in contact with educators from all over the globe who are excited about the opportunity to come to Shore and lead the school. Over the past few weeks, the Search Committee has been hard at work narrowing the field of candidates from the dozens of completed applications received to 12 semi-finalists. In making their choices, the Committee members were guided by the criteria that were established in part during the consultants' campus visit with the community this February. Later this summer each of the semi-finalists will be traveling to Boston to interview in person with the Search Committee. From these interviews the Committee expects to select three or four finalists who will come to Shore in September for further interviews and for an opportunity to meet the community. Anyone who is interested in meeting the finalists will be encouraged to attend and provide feedback to the Search Committee. Until that point, the search process remains private. Candidates have been assured that until the finals stage, all of their names will remain confidential. JANUARY 29, 2016 - Search consultants Marcus Hurlbut and Deirdre Ling of Educators' Collaborative are selected. The Head of School Search Committee is pleased to announce that we have engaged Marcus Hurlbut and Deirdre Ling from Educators' Collaborative to be our search consultants as we look to identify our next Head of School. Marcus and Deirdre have both transitioned into consulting after long, successful careers as school heads. After serving as Dean of Students at Roxbury Latin, Marcus went on to become the head of three schools: The Derryfield School (NH), Friends Academy (NY), and St. Margaret's Episcopal School (CA). Deirdre spent 13 years as Head of Middlesex School before leaving to join Educator's Collaborative in 2003. One of the many reasons the Search Committee ultimately chose Educators' Collaborative was their familiarity with and impressive history of success in the Northeast. This includes the recently completed search for the new Head of School at Belmont Day School, the search that placed Tim Johnson into the Head role at Pingree, and the placement of Sara Knox as the Head of the Lower School at Shore. The consultants will be visiting Shore for two days to tour the school and meet a diverse group from our community. These meetings are critically important to the process, as they will give Marcus and Deirdre in-depth understanding of what makes Shore such as special place and why this position is such a unique opportunity. The visit will take place on March 1st and 2nd. Everyone from the community who is interested in participating in the process is invited to join the group over the two days to provide insight into our school and pass along suggestions on the search. A more detailed schedule of the two days will be available soon. Prior to those meetings members of the Shore community will also be invitated to participate in an online survey. DECEMBER 17, 2015 - The members of the Search Committee for Shore's next Head of School are announced. This diverse group represents many constituencies within the community and has a deep understanding of Shore's strengths, culture, and history. There will be many opportunities in the future for all members of the Shore community to participate in the search process. Details on these opportunities will be made available soon. NOVEMBER 30, 2015 - President of the Board of Trustees Jennifer Borggaard announces that Head of School Larry Griffin will retire following the 2016-17 school year. In a special announcement to the entire school community, President of the Board of Trustees Jennifer Borggaard announced that Head of School Larry Griffin will retire following the 2016-17 school year. She wrote: “It is an occasion that will bring to a close the tenure of one of the most well-respected and most genuinely beloved independent school leaders anywhere.” Borggaard also announced that Board Vice President Josh Webber would serve as the Chair of the Search Committee that will seek Shore's next Head.